October 2, 2015 by Ecommerce News. About Cross-channel with tags Germany. 18049 views. The German fashion retailer Apparently Different has opened a pop-up store in Berlin yesterday. In the store, customers can order products from a touch screen while they are in the locker room. Via a tablet, employees get notified of the customers’ requests so they can search the desired items and deliver them through a drawer system directly into the locker room. Apparently Different, which says it brings the best of online shopping to fashion stores, has opened a pop up store which will be open for one month. But the company has plans to open a permanent one at the start of next year. 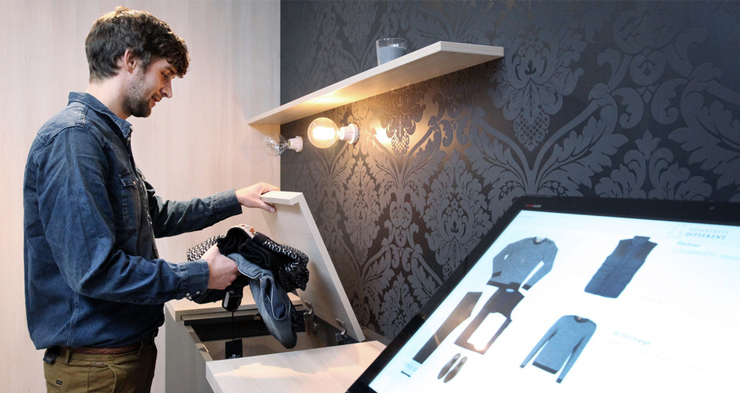 In the temporary fashion store, customers can choose the clothing they want to try on by selecting them on a touch screen. Then, an employee gets a notification on his tablet and will pick the selected clothes. These are then put into a drawer and in about thirty seconds the customer receives the items he wants to try on in the dressing room. “The advantages, such as the easy navigation through a huge online product range, are now connected to trying them on in a private atmosphere”, founder Dorian Freudenreich told BZ-Berlin.de. And trying clothes on happens in a dressing room that’s twelve square meters big and even has a small refrigerator stocked with refreshments. The pop up store is located at the Brunnenstraße in Berlin and is open until October 30.